Trying to add further realism to the conditions of the Earth, I like to see where the night and day side of the Earth is at the moment. Someone recently posted a new attempt at showing the Earth’s night and day conditions, and it updates automatically every 10 minutes. Is this update actually working? or it’s coming soon? 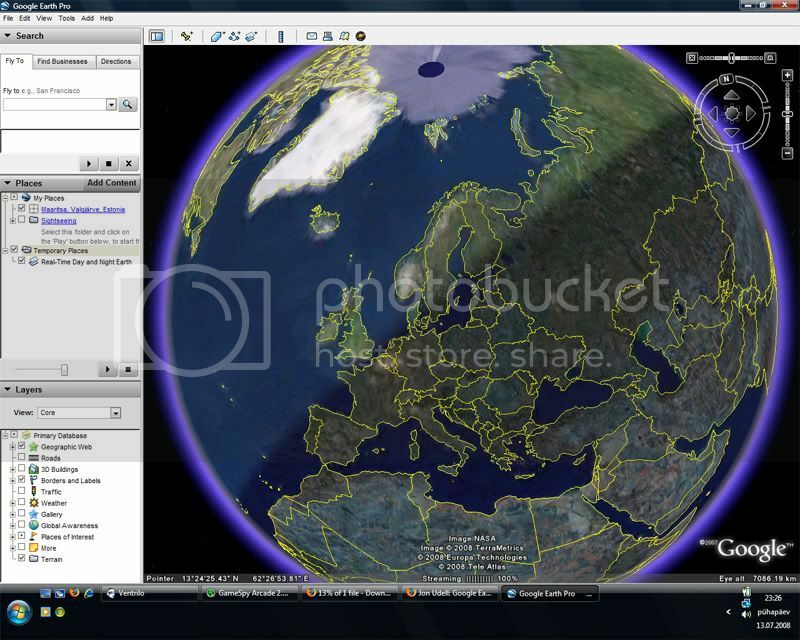 Just downloaded google earth latest with sky view. Dont see how to switch back to DAY mode view now from night view. I see the star view button. Hi, to deactivate complete Night view please uncheck the “Earth City Lights” in the NASA level. I would like to come back to warren’s problem: I too downloaded new GE and all I can see is night. 8) now click on the “Earth City Lights” check box and the view will change to day light. I was NOT pleased when all of a sudden My World went black! Woke up again this morning to find the same darkened nonsense happening. Thanks to the post above for explaining how I got into this idiotic situation,in the first place. and all because they selected the layer I chose, last night! Ridiculous!! and the sudden darkness that followed, SOME TIME AFTER! I’m a fairly smart and computer-savvy person, and had I not found this explanatory post, I would NEVER in my wildest dreams have thought the solution was where it has been now pointed out. THANK YOU!!!!!!!!!!!!! All I can say DH is AMEN! I was going nuts trying to figure out what happened to my day view!!?? This is crazy!! I even uninstalled and reinstalled GE, thinking that it would default whatever the issue was back to the non-night mode. It didn’t work. Only after tearing most of my hair out and looking for help did I end up here! Thanks again!!!!! Thank you to the person(s) who gave the solution here. THis is the fourth time I’ve made the effort to fix thje night view issue. I don’t even know how I switched it to night view. Yes, GE should fix that auto switch or at least address it in their users manual! It’s quite wrong… Finland,Sweden,Norway and England and stuff should also be at night when i took this screen shot. This also happened to me. I don’t know how that got selected… but all of a sudden today it was ‘lights out’ in GE and it took me about an hour of clicking around thru all the help options.. then i did a search and found this thread. Thanks to the person who posted the solution. I was starting to get frustrated. Adding my annoyance to the Going Dark issue. Suddenly, without asking, my google.earth went black. It has taken me 4 hours to find the solution (tucked away in the blog). I still haven’t implimented it — we’ll see. OF COURSE one should look under NASA rather than NIGHT VIEW or something OBVIOUS! Why not file it under “pure bred cats”? I know I am ONE OF THOUSANDS of VERY unhappy users. Thanks for the help everyone… I was frustrated as well b/c i’ve switched to earth city at night sometime in last week & was trying my very best to figure it out but couldn’t. So I ended up here after i’ve type in “switching back to earth city at day” in my google toolbar. To make it easier.. i’ve clicked on one of the NASA icons which then shows the picture tht i wanted to see but at the top of tht picture there was an option states “Hide this layer”. I clicked the hide this layer option & suddenly goolge earth was back to daylight…my frustration is now over after a week if trying to figure out this issue… Thanks again Wunold. Earth looks beautiful in the night sky. I really like the picture. Same problem and had no idea how this changed. and Googles own guide doesnt mention it! Or its well hidden. Thanks for the Info. How do I switch back to day view? I can’t see anything at night! I had the same problem, but the NASA was already checked. I found it in the temporary folder, deleted it and the light returned. How do I switch to day view? We could enjoy all the night view of the world in the Google earch. Great idea! How do you switch to night view? Very knowledgeable reading. This is such a great resource that you are providing. I have tried EVERYTHING and STILL have nothing but night view. To add insult to injury, as well as having the constant unresolvable issue of night view 100% of the time respective of NASA or any over setting, I previewed the post I just spent more time writing only to find that when I tried to actually post it it disappeared. So I am writing this one. Astounding, Google. Why don’t you search the web for the term ‘customer relations’? It might be a whole new area for you to get into. Same problem here, I am using Mac OSX version of Google Earth. I cannot change from night to day either. I have tried the NASA bit about checking and or unchecking the show city lights box, I followed all the instructions, it makes no difference, adjusting the date and time on GE makes no difference either, I have deleted Google Earth. Google Earth is a waste of time. Works very well. Great Job!